Systematic Investment Plan (SIP) is an investment strategy where an investor invests a fixed amount in a fund at a periodic interval. SIP gives the benefit of rupee cost averaging, which involves buying a fixed amount, regardless of the price at different time periods. The units are purchased regardless of the market. For example, when the markets are high, we get fewer units, whereas when markets are low, more units are allotted. 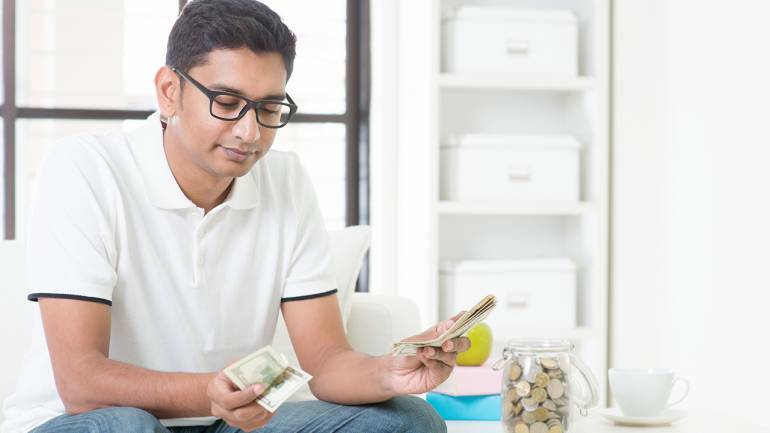 Disciplined investing through SIP is the ideal way to inhabit regular savings and to reduce the risk of large investments. An SIP in the index started 20 years ago with a Rs 1000 installment would involve an investment of totaling Rs 2.40 lakh. The current value of this SIP would be approximately Rs. 15.90 lakh. This translates into an XIRR of 12.45%. SIPs can be done across various funds. An investor has a choice to start an SIP in a variety of funds – Large Cap, Midcap, Diversified Funds. Every investment represents different types of volatility and subsequently different returns profiles. As a proxy, we have used Sensex to represent Large Cap, CNX Midcap for midcap, and BSE200 for diversified, assuming an SIP of Rs.1000 is done on the 1st of every month. The chart below shows the investment value of an SIP done for the last 5 and 10 years in Large Cap, Midcap or Diversified. If one would have had an SIP running for 10 years, Midcap would have delivered higher returns as compared to others. An SIP can be done for any period of time. The above table shows minimum, maximum, average return for SIPs done in Sensex Index, for a period of 3, 5 and 10 years. 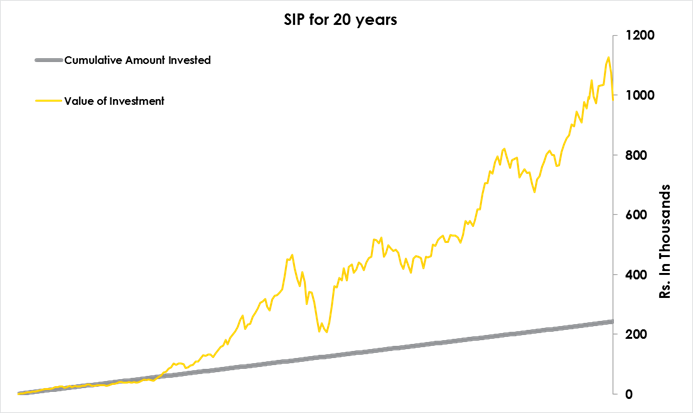 To calculate the same, we have taken rolling SIP investments starting from October 2000 to October 2018, an SIP being made on the 1st of every month. The maximum returns for 10 years were 24.6%, with the lowest probability of negative returns. 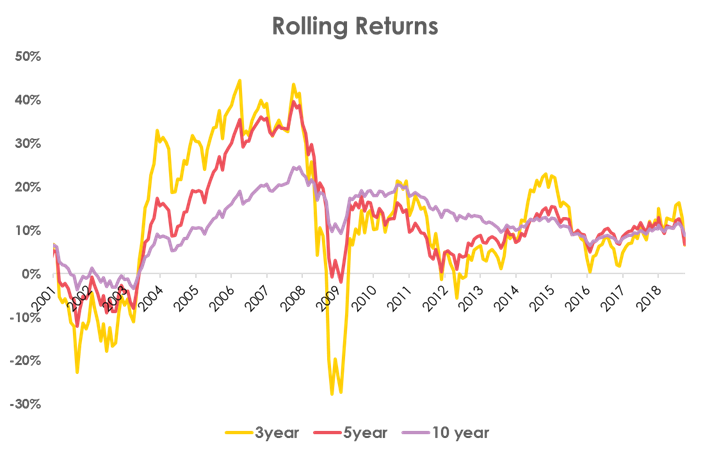 The chart given below shows the rolling returns from 2000 to 2018. The chart shows the volatility of the returns in different time periods. 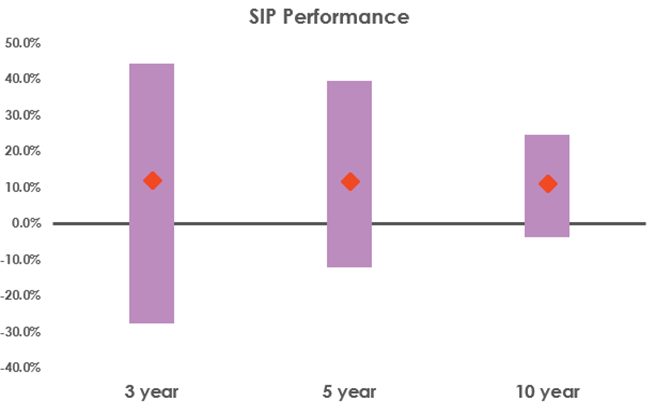 It is senn that the longer the SIP investment period, the lower is the volatility of the returns.